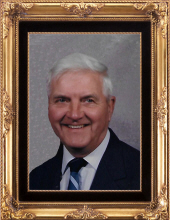 Robert R. “Bob” Heineman, 89, of Woodville and recently of Pemberville, OH passed away on Thursday, January 24, 2019 at Otterbein Senior Life Community. He was born on May 1, 1929 to Roy E. and Verna A. (Linke) Heineman in Woodville, OH. He married Clara R. Gerwin at Solomon Lutheran Church on November 19, 1950. Robert and Clara raised two children and celebrated 68 years of marriage together. He served his country in the U.S. Army during the Korean War, qualifying as a sniper with open sights on the rifle range. His background in banking led him from the front lines to a promotion in the finance office, where he was honorably discharged as Sargent. Robert worked at the Woodville State Bank, attended the American Institute of Banking and the Ohio School of Banking. Over a 42-year career, he worked his way up from teller to President and Chairman of the Board at the Huntington Bank, retiring in 1989. Robert was known for his level-headed manner, uncompromising ethics, quick smile, and the warm, friendly way he cared for people. In a small town, he kept the confidences of many and his sound advice will be greatly missed. Although he was a talented, accomplished man and tireless volunteer, Robert loved his Lord and his family, especially his grandchildren, Rob and Jessica, who he cherished very much. Robert was a lifelong member of Solomon Lutheran Church, where he served on numerous ministries and committees. He also served on the Luther Home of Mercy Board of Directors. Robert was also an avid golfer, active in leagues over his life in Woodville, Oak Harbor, and Elmore, Ohio, often serving as treasurer. Robert was a member of the Bank Administration Institute and the Huntington Bank Board of Directors. Locally, Robert served his community at the Woodville Clarence L. Nieman American Legion Post #455, the Woodville Kiwanis, he was a retired member of the Woodville Fire Department, and retired Treasurer of the Woodville July 4th Celebration – a position in which he served for 25 years. Young people and education were important to Robert; as evidenced by his service on the Woodville and Woodmore School Boards of Education and the Sandusky County Board of Education. He had a love of community and country, and upon his 40th year at the bank he was recognized by the community with “Robert Heineman Day” on July 7. 1987. Robert is survived by his loving wife, Clara; his son, William R. (Theresa) Heineman of Woodville; daughter, Amy (Tom) Richcreek of Sylvania Twp. ; and grandchildren: Robert John Heineman of Sylvania, and Jessica J. Richcreek of Toledo; and brother: Paul (Evie) Heineman of Woodville. He was preceded in death by his parents. To send flowers or a remembrance gift to the family of Robert R. Heineman, please visit our Tribute Store. There will be additional visitation from 1:30 p.m. until time of service. Officiating will be Rev. Merlin Jacobs. There will be a bereavement meal served at the church fellowship hall immediately following the service. "Email Address" would like to share the life celebration of Robert R. Heineman. Click on the "link" to go to share a favorite memory or leave a condolence message for the family.